It was one of those players who foresaw the need for a County association and it was during the summer of 1977 that the first Clwyd women’s netball team was formed. The sole instigator for this was Maureen Pearce, a former schoolgirl County and North Wales player who encouraged players to join her in forming representative teams at Senior and Under 21 level. Aided by honorary secretary Barbara Morris, players were invited to attend for trials. During our first year county fixtures were arranged between Shropshire, South Yorkshire, Cheshire and Lancashire. These counties proved to be tough competition for our newly formed teams, but provided us with a valuable insight into the standard we had to achieve if we were to continue to play netball at Senior County level. It was this year for the first time Clwyd entered a senior team in the Welsh Inter Counties Netball Tournament in South Wales. The following year 1978 Clwyd Women’s Netball Association was formed. 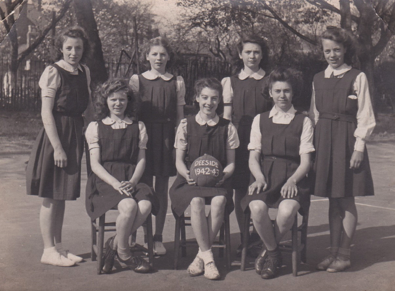 The association was successful in encouraging more Sports Centres to promote netball and slowly but surely the popularity of netball increased throughout the county, providing us with many excellent players. At this time umpires had been provided by the Cheshire association and it is only fair to mention Gilly, Lynn Godfrey, Rose Hughes and Jen Leech who gave their time freely to train our first umpires, and to thank them for the valuable assistance and support they provided to the sports centres and our association. Jan Blackwell provided coaching assistance. After three years hard work and commitment came our defining moment. Clwyd hosted the Welsh Inter Counties Tournament for the first time, a truly testing moment for the association, not only did we host a well organised and successful tournament, our dream came true when the Clwyd Under 21 team became Welsh Under 21 champions. Clwyd had truly made its mark on the Welsh netball map. In the ensuing seasons Clwyd players were selected for the Welsh Squad and a number represented Wales at international level, once again demonstrating the standard that had been attained in a short time. That was many years ago and it is deeply satisfying to see that the association has passed into safe hands over the years. It is apparent that the association has gone from strength to strength and is stronger than ever, my hope is it will remain so for many years to come. Oldest photograph given to the Association by Alan who found it in his mum’s possessions. His two granddaughters, Beth & Lili Coppack, are members of Deeside Netball Club.